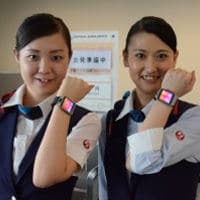 Japan Airlines (JAL) staff at Tokyo’s Haneda airport are being provided with smartwatches that work in conjunction with Bluetooth Low Energy (BLE) beacons, to give management a way to assign staff more efficiently and respond more swiftly to customer requests. Beacons are being placed at each of the airport’s domestic terminal one boarding gates, with staff issued with Galaxy Gear 2 smartwatches. The LG G Watch will also be tested during the pilot, JAL says. The beacons installed at the gates will be used to pinpoint the location of each of the JAL staff equipped with a BLE-enabled smartwatch. This location information will then be monitored by a controller in the back office, enabling managers to send assignments to the frontline staff best placed to respond swiftly to a need. These assignments will appear as alerts on their smartwatches. The airline is working with Nomura Research Institute (NRI) on the project, which is due to start in the next 30 days.